Greenhouse 4'4" x 6'4" wide. Growing area 2.3m². Door opening width 600mm. No. of vents 1. 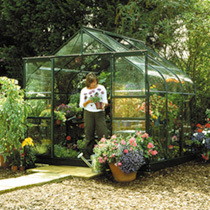 The elegantly curved eaves section of the Highgrove is a welcome escape from the traditional greenhouse shape. Smooth action roller sliding door plus a hinged roof vent provide easy access and ventilation. 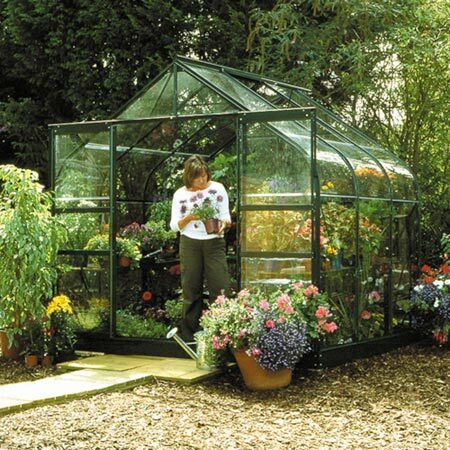 Glazed in 3mm toughened safety glass, with a single pane for side and roof sections - so much safer than the easily broken panes of standard horticultural glass fitted to most greenhouses. Curved eaves sections are of U.V. treated acrylic. 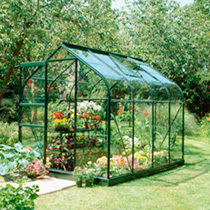 Delivery & Assembly: All greenhouses are delivered in one drop complete with glazing. Full assembly instructions are provided, and two people could normally expect to complete assembly in a weekend.